Brighton midfielder Dale Stephens says it's exciting playing alongside Albion's in-form wing wizards Anthony Knockaert and Solly March. March returned to action in November after 11 months out with a knee injury and is now getting back to his best, while Knockaert has been in outstanding form this season. March and Knockaert set up two goals each in Saturday's 4-1 win against Burton Albion and, on playing alongside the duo, Stephens said: "It's frightening. They help you a lot and they both carry the ball when you're under a bit of pressure, so they relieve that. "They can change games with assists and goals and it's exciting to be in the same team." On how high the wingers can go, Stephens said: "Anthony's played in the Premier League already and he's a special talent, as Solly is. "Solly's still young and he can be whatever he wants. He's a top player and hopefully he can stay fit now." 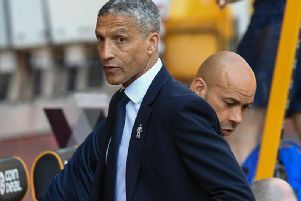 Knockaert has moved on to five assists for the season, with four in the past two games, and Albion boss Chris Hughton said: "It's the same with all offensive players, we all know about a goalscorer - sometimes they can not score for a few and then a few come at once. "With Anthony, it's never about a lack of trying. It's sometimes just about that final ball and getting players on the end of it. He's certainly deserved it (the assists) because his endeavour has deserved it."